Put me on the waiting list. The item you are trying to purchase is currently backordered. Each of the 100 gelatin capsules contains 500 mg of L-Arginine, guaranteed pure and potent from Self Health Resource Center. Suggested Use: Persons 12 or more years of age, take 1 capsule daily or as directed by a health professional. 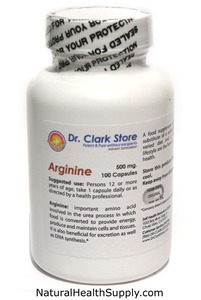 Arginine is an important amino acid involved in the urea process in which food is converted to provide energy, produce and maintain cells and tissues. It is also beneficial for excretion as well as DNA synthesis. A food supplement is not a substitute for a varied diet. A varied diet and a healthy lifestyle are the basis for good health. Store this product in a cool dry place. Keep away from children. Do you have questions about this item? Ask here.